Latex Coated Gloves Dozen Pairs. 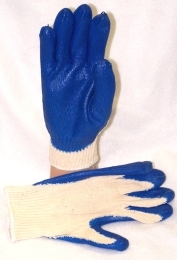 Blue latex coated string-knit glove. Textured palm and fingertips. Cotton shell. Bulk packed one dozen pairs per poly bag. Made in China.